At 8pm at 17 December 1943, 19-year-old Quartermaster Robert Lang finished his shift at the wheel of merchant ship SS Kingswood. He headed down below for a meal, sat down in the mess room with his mates and picked up his cutlery. “As I put my knife and fork to the plate, the torpedo struck the ship,” he said. Robert is one of a number of Second World War veterans who will be returning to the place where they served as part of the Big Lottery Fund’s Heroes Return 2 programme. The 88-year-old from Preston will be visiting Gibraltar and Morocco on the west coast of Africa this year – near where his merchant ship was torpedoed 68 years ago. To date more than £25 million has been awarded to over 51,000 Second World War veterans, widows, spouses and carers across the country for journeys in the UK, France, Germany, the Middle East, Far East and beyond. Robert recalled how he fought for his life escaping a sinking ship, clinging to a piece of wood in shark-infested waters, his rescue by local African fishermen, and treatment by a witch doctor on the Ivory Coast before friendly African forces helped his shipmates to a hospital. Decades later he managed to contact and even become friends with two members of the same U-boat crew that sunk his ship. Weeks before the U-boat struck, Robert’s ship had previously called at Gibraltar. The ship loaded with cargo in Lagos in Nigeria and on 17th December set sail for UK. It was passing the Ivory Coast when the torpedo slammed into its side. “All the lights went out – and the steel door to get out was jammed,” said Robert. “The ship was turning and the portholes were below the water line. It was like a sealed coffin. Someone shouted ‘we’re going’ and I thought we were headed to the bottom of the ocean. Then there was another explosion from the ammunition locker. That saved us – it blew the steel door open by 18 inches – just enough for us to squeeze out. “When we got on deck the ship was leaning about 45 to 50 degrees. The engines should have been turned off when the captain called abandon ship but hadn’t been. We were trying to get a lifeboat down but the ship was dragging it along. Because the ship didn’t stop a second torpedo was fired which hit. “I was blown clean out of the lifeboat and into the sea. I went straight down and thought that was it. When you hear of people saying you see your life and family before you it’s all true – and it wasn’t a fearful feeling. Eventually I popped up near the rotating blades. The ship kept going for a bit further and then turned over and sank. But the ordeal on the seas was not over. Suddenly, they heard and engine and a searchlight suddenly swept onto them – the deadly German U-boat had surfaced. Robert, with broken fingers, injured arm and a gash in his groin, drifted in the lifeboat for two days while sharks circled the boat. After two days adrift they spotted local fishermen from Grand Popo in long canoes who helped them find the shore. Robert and his shipmates then walked for days through the bush, coming across another tribe who killed a wild boar and fed them. Days later they met soldiers from the Royal West African Frontier Force. He was taken to a hospital in Takoradi in Ghana suffering from malaria where he spent Christmas day and eventually made it home, five months after the torpedoing. Decades after the war, sometime in the early 1980s, Robert discovered the name of the U-boat – U515 – and wrote to the German Embassy for see if there was an association. They replied with contact details of two members of the crew from the submarine. He became pen pals with Carl Moller and Herman Kaspers. One day a couple of years later Robert’s phone rang. Robert, Carl and Herman stayed in touch for many years and Robert paid four visits to Germany, one time talking a tour of a U-boat on the Elbe with Carl and another occasion visiting Herman and his brother Helmut who also served on the U-515. 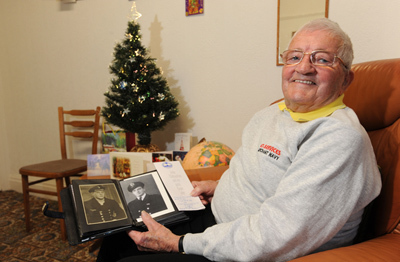 Robert served on nine merchant ships during the war. He has received a £800 grant from the Big Lottery Fund and will be visiting Gibraltar and Morocco in June next year. I was fortunate to have opportunity of meeting Robert on a recent flight from Manchester to Gibraltar on June 11th 2012 on his heroes return. I would like to convey that he is a fascinating and very interesting man with an incredible memory of the historic events. He was so passionate about sharing his memories so that other people can understand what the forces went through during this period. I was also very impressed by Robert having the desire and will to do this at the age of 88 and travelling across to Gibraltar by himself, he is a true hero.